Percussive outbursts set against long Romantic lines, interrupted by snippets of Beethoven and Rossini, fragments of recorded bird calls and radio broadcasts, performers whispering, different musical languages interacting and colliding, a soprano in the balcony – all can be heard on this CD of works composed by one of today’s masters of musical collage and stylistic time-warp. Elliott Schwartz’s music has been described as “beyond eclecticism” (Tim Page, New York Times), and lauded for its “ebullient personality... fertile imagina- tion and bright spirit” (Patric Stanford, Music and Vision). “Hall of Mirrors” is the title of one work on the disk – an extrovert- ed, free-wheeling suite for saxophone quartet and piano – but it could apply equally well to all four pieces recorded here, as numer- ous “mirrors” – echos, displaced registers, melodic and rhythmic variants, literal reflections, crazy fun-house distortions, and incur- sions from the real world beyond the concert hall – keep popping up within Schwartz’s overlapping textures. There is an Ivesian qual- ity to the way in which his seemingly incongruent, contrasting ma- terials appear in unexpected juxtapositions – all fusing together, however, to create a surprisingly consistent, singular language. Schwartz loves to walk the fine line between “music” and “theater.” Accordingly, three of the four pieces on this CD – Rain Forest with Birds (concert band and recorded bird sounds), Hall of Mirrors, and Crystal (piano and percussion) abound in theatrical gestures, making use of antiphonal-spatial placement of forces, performer- speech woven into the texture, and (in live performance) movement by the players and lighting effects. Schwartz also enjoys exploring a wide range of brilliant instrumental color, as evidenced by his use of the saxophone quartet medium, exquisitely sensitive percussion timbres, and the stark contrasts of Kaleidoscope – what an appropriate title! – for violin, contrabassoon and piano. The performances are all outstanding for their verve, spirit and virtuosity, and a number of the players, such as saxophonist Ken Radnofsky and contrabassoonist Hank Skolnick, are internationally acclaimed. The Radnofsky Quartet, Hoffman-Goldstein piano-percussion duo and Harvard University Band are well known for their pioneering commitment to new music and their many commissions to composers. All of these players dig into Schwartz’s polystylistic sound-scapes with energy and enthusiasm! Be prepared for a crazy- quilt fabric of Wagnerian harmonies, Cageian improvisation, found sounds, 12-tone pitch sources, and theatrical gestures, occasionally bouncing off one another and often fusing into something entirely new. Here. Maine's foremost composer gives free rein to his love of unusual timbres – the contrabassoon has to be heard to be believed – and percussion, which he makes melodic, like the opening theme of Gershwin's Concerto in F. He also demonstrates conclusively that good musicians, such as the Harvard Wind Ensemble, can compose on the fly when they are given the setting and opportunity, with results as satisfying as anything fully written-out. .....Characterized by slow, melodic sections punctuated by energetic and soaring harmonies, “Hall of Mirrors” also incorporates the twitter of the piano seamlessly. Elliott Schwartz’s new CD is a marriage of 12-tone writing and exceptional orchestration. Schwartz understands the diverse musical possibilities of serial music and seems to delight in the opportunity to explore them. Much of the music on this CD is heady, thinking music, music that forces you to pay attention, to listen for the jokes, the musical explanations, the special moments when Schwartz is able to convey his thoughts so clearly as to be truly extraordinary. Schwartz writes music that wants to be listened to. He shares with John Zorn a talent for imaginative musical collages, and he has much of the brittle, harrowing suspense and drama of Bernard Herrmann. I recommend the CD strongly to all. It is the product of a very skilled and interesting composer. Like me, you will surely enjoy all the works on this CD–double reed or not–because of the composer's ability to reel you in with his curious and interesting style. Elliott Schwartz, now in his early seventies, is an unclassifiable American composer who’s had a long international career. I called him the joker in the pack when reviewing an orchestral CD (A/04) but that isn’t the whole story even though you never know what’s going to happen next. His Hall of Mirrors, for saxophone and piano, suddenly comes up with a chorale in plain triads in its fifth movement – a reminder that Schwartz has written a book on Vaughan Williams’ symphonies. There’s the same sort of surprise in the second movement of Crystal where Schwartz uses sly quotation and games turning letters into musical notes. There’s an oriental flavour to the third movement and the last one contains a kind of Satie waltz. Kaleidoscope, for the unlikely combination of violin, piano and double bassoon, is a single span - fascinating to hear so much of the contra in a chamber work. Some of the tonal music suggests Brahms or Franck but all within Schwartz’s own fastidiously controlled discourse. Rain Forest with Birds is for band plus various recordings and can be assembled in different ways: there’s no definitive score. The perambulating bird sounds are evocative and, as with such flexible pieces, it all comes and goes. When I see a program with a work of sax quartet, I think I know how it will sound. The idioms of the alto, tenor and the soprano could be the hunting calls and clarinets-in-thirds of the 20th century. 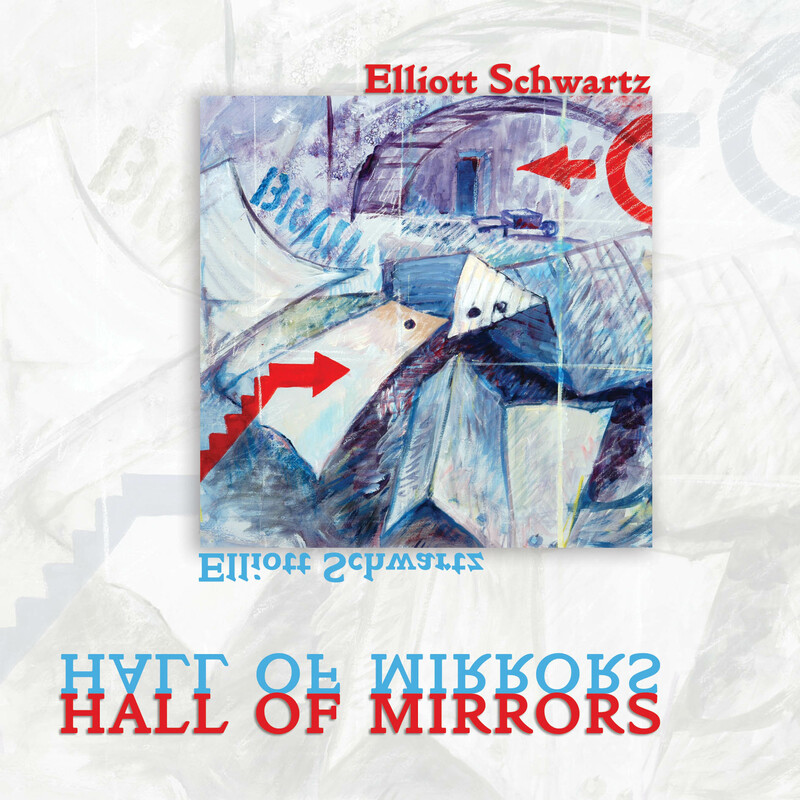 Elliot Schwartz’s Hall of Mirrors, fortunately, steps outside instrumental conventions and spells “SACHSOFONE” musically. The piano, played by the composer, adds depth to the piece. Spelling games, counting games, and tone rows stray from being gimmicks, and moments of exaggerated artifice and a Gershwin quotation are humorous, yet not forced. Crystal: A Cycle of Names and Memories, for piano and percussion, contains precise interplay between the piano and pitched percussion, arising from nothing in the first movement and receding back into it in IV. Rainforest with Birds is performed with three CDs of bird sounds – some real recordings of actual birds and some classic, musical interpretations. The rainforest, however, seems to also be inhabited by savage dinosaurs; and brash, fortissimo outbursts by growling brass dominate the early part of the piece. But Rossini, Vaughan Williams, Charlie Parker, and William Byrd enter to tame them.